Not every one wants email notifications or step-tracking on their timepieces, but Longines has created an analog watch that cleverly integrates one useful smartwatch feature: easy time zone adjustments, without requiring a wireless connection to your phone, or the watch to be charged every night. The new Conquest V.H.P. GMT Flash Setting looks like a traditional analog watch, but with an electronic quartz movement powering the hands, Longines claims it will only gain or lose about five seconds over the course of a year. The watch also integrates anti-shock functionality that will automatically re-align the hands to the correct time should the watch get bumped with enough force to throw them off in the first place. 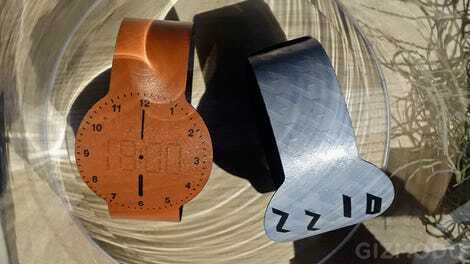 But that feature’s not entirely new to the world of analog timepieces. 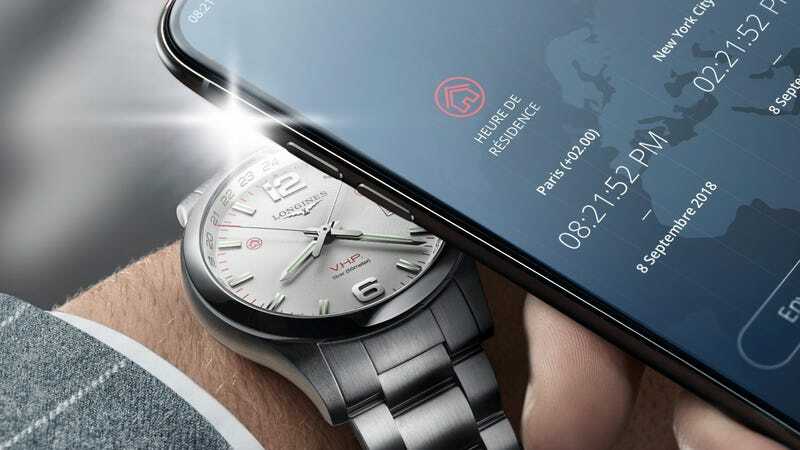 What Longines has done is come up with a clever way to integrate the timepiece with an app on your smartphone for easy time-zone adjustments while you’re traveling. If you look closely at the watch’s face, you’ll notice a tiny dot hidden on the number 12 that reveals a tiny light sensor. When you’ve arrived at a different part of the world and need to adjust the watch to the local time, you can select the city you’re in from a new Longines app, and then point your smartphone at the watch’s face. It will automatically reprogram the watch by pulsing your smartphone camera’s flash, creating an encoded message that is decoded by the watch’s light sensor. It removes the need for the Conquest V.H.P. GMT Flash Setting to have power-sucking wireless connectivity like wifi or Bluetooth, which in turn allows the watch’s battery to last for a few years before it needs replacing. Switching between your original timezone setting and the new one is as easy as tapping the watch’s crown dial a couple of times, so you don’t need to keep pulling your smartphone out to check if everyone back home is sleeping before making a phone call. Available in four different dial finishes: silver, blue, black, and carbon fiber, the Conquest V.H.P. GMT Flash Setting will be pricier than most smartwatches, coming in at $1,350 for a version with a rubber strap, and $1,750 for the version with a metal band. But it doesn’t look like a smartwatch, which is what many timepiece enthusiasts care about nowadays, even if it’s secretly providing some of the conveniences that modern timepieces offer. Do You Love Pokémon Enough to Spend $20,000 on a Pikachu Watch?